Well that's this trip done and dusted. The last week or so I travelled up through the Baltics. For the geographically impaired out there the Baltics are the three tiny countries, Lithuania, Latvia and Estonia that are sandwiched by the frigid Baltic Sea and big Red Russia. It probably wasn't the best time of year to visit this little segment of the world. Winter has definitely come early and we were treated with sub-zero temperatures at night and whenever we headed out of the city to do anything suggested in Lonely Planet we were generally confronted with 'Why are you here now? ', 'Why didn't you come in the summer?' and most of the towns needed to be prefixed with the word 'ghost'. If I was travelling alone, it would have sucked - the hostels were starting to empty out. Most of the cool people in hostels have headed back home to go back to Uni or find jobs cause they'd run out of money. Luckily to save me from eating alone, or spending a lonely night reading a book in a barren common room, I had two other lads to entertain me in cases like these. I know I usually extol the virtues of solo travel, but I have to admit, I'm coming round to the concept of travelling in groups greater than one. Apart from the obvious benefits like the ability to buy food in a supermarket and not live off pasta and tomato sauce for four days or having someone sit with your bags while you run off to find a toilet in a bus station, you get a different experience when others are involved. I never would have found out about the 'Wheel' at Oktoberfest without Cristyn or never have met 'Drunk Lithuanian Dude' if Hedgys bike hadn't fallen over at the right time (I'll upload the video soon for non-Facebookers out there). Of course there a there's the negatives, it's always a bit harder to book three beds or seats on a bus than it is when you're alone. I've always liked the flexibility of being able to get up and totally change your route without having to hold a discussion meeting. Then there's the less obvious things; I've always prided myself on being a grade A dorm resident, always quietly sneaking in when getting in late, keeping all my stuff from getting in the way and the like. Then these boys come along and suddenly 5am form room wrestling matches and bread fights become the norm (so we're told).Then there's the jokes. I can handle the constant Anchorman and Borat quotes, but these guys original work makes Dad's jokes look like a hybrid of Seinfeld and The Office. Just for example, as we walked though Warsaw I commented on how few old buildings there were, so the town must have been bombed heavily in the war, to which Hedgy replied, 'Well it is War-Sore'. Warsaw, War Sore, get it. I just wish I could get my disdain across more obviously in text. So what did we do? Visited the three capital cities; Vilnius, Riga and and Tallinn. All fairly similar with small quaint old towns. Visited the Corunian Spit in Lithuania, rented bikes and rode down to the Kalinigrad border, which was nicely Russian with lots of cameras, gates and warning signs. We also headed to a place called Sigulda, the outdoor capital of Latvia where we were either going to Zorb, Bungy Jump or go on a bobsled ride. Unfortunately we missed out on Zorbing due to forgetting about the time difference between Poland and Lithuania. The Bungy Jump didn't start until 6:30pm, and it was dark by 6. Then there was the bobsled, which firstly was out of season, so we would have had to have gone down on a wheeled sled, 'Cool Runnings' style, but it turned out the Latvian Olympic team was training that day. Bit of a fizzer of a day. 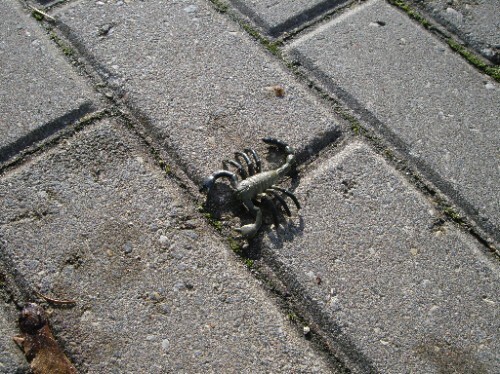 We also spent 5 minutes taking photos of the biggest scorpion we'd ever seen, which turned out to be made of plastic. Losers. The Baltics are also pretty damn cheap. Hedgy turns out to be just as much of a gannet as myself, we were dining on 2 main meals for lunch and dinner in Lithuania for under $10AU - the food was so good too. Latvia was all about chicken (chickON) from the supermarket. At about $2.50AU for a third of bird, how could you go wrong - I think we went through about 3 chooks a day between the 2 of us. It balanced out through cause Arun is vego so just ate lots of carrots and cauliflower. So that's it for the trip, I'm sitting in London now, just about to send my resume to my recruitment guys. I'm not really that keen to work, but the potential for upward of 25 quid an hour, I can't say no. The blogs will probably become fewer and farther between than they already were; considering how many of you have already seen this part of the world there won't be as many chances for my startingly witty and blunt observations . Will keep you lot up to date of news and what not from here.